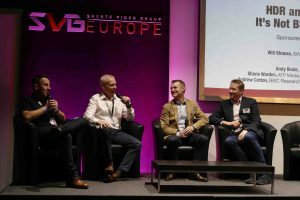 This is how SVG Europe Contributing Editor and session chair Will Strauss opened the ‘HDR and Live Sport: It’s not Black and White’ panel at the recent FutureSPORT 2018 in Manchester. As he put it, high dynamic range (HDR) and live sport is a grey area where sports broadcasters still face technical, logistical and commercial obstacles. However the session, featuring broadcasters who have been leading the move to HDR, certainly revealed a lot of detail about what works live. One of the themes was whether HDR should only be offered alongside Ultra HD, or can be part of HD broadcasts too. For sport, particularly tennis, Shane Warden, ATP Media’s Director of Broadcast and Technology, wants to achieve “the biggest bang for our buck” in UHD production, and he believes HDR has the most impact on the viewer, followed by frame rate, while resolution has the least. This is why “we decided to go down the 1080p 50/60 HDR road,” which is what it used in its most recent event at the Next Gen ATP Finals, the ATP World Tour’s inaugural tournament for 21-and-under players, in Milan in November. He believes that it is best to acquire in the highest resolution (UHD). Having previously worked in feature film and TV post-production, where he found any efforts to preserve the best quality of each pixel were repaid in better results in any final format. 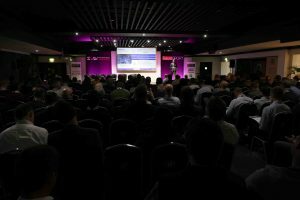 “We can achieve this in the sports and OB world to help us over some of the hurdles we face,” which for tennis includes having to travel around the world to 24 different venues, so it needs something that is highly portable and easy to set up, while also controlling costs and overcoming the distribution challenges it faces in each country (which would be far greater in UHD). “The premise is quite simple. Look after the pixels and work in a way that we can acquire in high resolution at the front end, using 4K sensors and cameras, but immediately bring it down into a 1080p 50 world, working in Log all the way through,” delivering either in 1080i SDR or 1080p 50 HDR for broadcasters to take and upscale to UHD if they want. This applies not just to EVS replays, but archive content, shared media and ENG material too – where even if it is shot in Log, may be a different sort of Log. The challenge was how to work effectively in a Log environment while trying to match the look of the live HDR images. ATP Media did a lot of testing with its system integrator Gearhouse Broadcast, as well as Grass Valley, Sony and Adobe, in the run-up to Milan. The end result wasn’t a test. “Everything we produced in 1080p 50 HDR was what we transmitted in the world of 1080i 50, and we were delivering directly from the edits all SDR as well as HDR content directly to the broadcasters,” said Warden. The BBC used Hybrid Log-Gamma for HDR at four events over the summer, starting with the Royal Wedding, “which allowed us to trial all the workflows we used in the other events,” said Andrew Cotton, Principal Technologist, BBC Research & Development, and co-inventor of the HLG format. “That was a co-production between the BBC and Sky, and even though neither of us was able to transmit the programme in UHD HDR we wanted to capture the event for the archive in the highest quality. We were fortunate that all 76 of the BBC cameras, including the radio cameras, were able to operate in HLG HDR. Sky was to take that UHD feed and it needed to be converted to SDR so that they could intercut with their own SDR cameras,” so they needed to match. At the World Cup, in Moscow, HBS produced its coverage in S-Log3 while the BBC’s production ran in HLG, “but we needed to make sure that the replays at half-time, which came from our HD Rec.709 studio looked the same as the main HDR match coverage, which was going through our HD production but had been converted from S-Log3,” said Cotton. At Wimbledon, there was a mixture of wide colour gamut HLG cameras and SDR Rec.709 cameras and replays, all of which had to be matched. That was critical because the grass on centre court isn’t actually green. “There is a little bit of blue in there that is outside the 709 colour gamut,” which was visible with the wide colour gamut cameras, but not ordinarily with Rec.709. The BBC was also involved with the European Athletics Championships, through the EBU, where the main challenge was with high frame rates (dealt with in another FutureSPORT session). Colour matching was a problem with all the events, although “it is easily achieved if you remember two important factors: one is to do your format conversions between HDR and SDR and SDR and HDR using scene lights.” Most conversions use the display light, which you try to recreate exactly in the new format, as this is what you want for graded content. “The trouble is, the look of all these production formats (SDR 709, S-Log3, HLG, PQ) are all different, so if you work in display light you’ll never get the conversions to work.” Instead, you calculate the light that is falling on the camera sensor (the scene light), which gets you 90% of the way. “The next thing to do, if you are using Rec.709 cameras, is to “relax the signal limits, and allow the signals to go above 100% and below 0%.” The BBC uses -5% and +105% to enlarge the SDR colour gamut. “By doing that you are able to match the Wimbledon grass inside the centre court,” he revealed. ATP Media “ended up placing our graphics at about 38%, which is quite low, but a lot of it is based on the way we were working in the display sense, across all the monitors and all the conversions we were doing. We ended up finding that our graphics sat really nicely,” added Warden. “Preserving the intention and integrity of the SDR is so important, not just for our viewers but also our rights holding partners,” said BT Sport’s Chief Engineer, Andy Beale. This is why most of its initial HDR productions had the HD/SDR and UHD/HDR productions separate, such as when it was host broadcaster of the 2017 UEFA Champions League Final in Cardiff, which Beale believes was the largest HDR production attempted at that time. BT Sport also did this year’s FA Cup Final from Wembley, and since then has experimented with HDR graphics on a live HDR feed, but replays are still an issue. It has recently done four events (two with Timeline and two with Telegenic) as single format productions offering both UHD and HD in both SDR and HDR (although both versions of HDR were done as tests viewable on mobile devices). Beale has found the hardest part of the HDR conversion to be the wide colour gamut. “High dynamic range without wide colour gamut is a strategy [for some productions], because it is easy to do,” but it sacrifices many of the benefits of HDR, particularly the faithful colour rendition of things like team strips (as demonstrated at Old Trafford last month when BT Sport covered a Manchester United match in HDR). “For us, it’s really important,” but it is difficult to achieve consistently, particularly in changing lighting conditions, and requires training to ensure that everyone starts with the same baseline (particularly the vision engineers). “Consistency in HDR shading is very difficult to achieve,” not just match to match, but even within a single match. “If you look at any [HD] broadcast since 2006 produced by any major tournament, the pictures are all the same.” However, getting consistency for HDR productions “is really quite tricky,” partly because people are still experimenting with what is correct, and there is still no standard interpretation of best practice. Of course, “you’re not exploiting everything HDR has to offer,” going from really dark to really bright, “but you have to remember people are watching this content in the living room, not in a dark production van. So, if something is really, really dark, they might miss a lot of what you are seeing in your truck. Keep it safe for the time being, you’ll still get great looking HDR and once we have got dynamic HDR to SDR converters that can actually slide up and down the exposure latitude of HDR to carve out the nice SDR picture, then we can start to be a little bit more adventurous,” said Cotton. A further problem with setting up for HDR is that “we quite often rig in the daytime and broadcast at night,” added Beale, making it very difficult to have an accurate reference to check against or to place the graphics correctly as they can easily end up way too hot. To help address this, the most important aspect Warden has found is monitoring. “If you do not know what you are looking at you are going to get lost very quickly.” ATP Media were lucky that when they started they had some expensive, well calibrated Sony X300 monitors, so they were able to compare them to all of the other monitors they used and refine them – “You’ve got to go pretty deep into the menus” to get the best out of them. “It really surprised me how far you had to go, and the tweaks we had to do to finally say: ‘This one is good. I trust this one’,” bearing in mind the often poor lighting conditions in the Portakabins, which is also important. “If the environment you have isn’t conducive to seeing the screen, you already start at a disadvantage,” he explained. Besides having their displays set up correctly, it was also essential for everyone to be able to view the transmission in HDR so the editors could see what they were aiming at. Indeed, the only ones monitoring in SDR were the racks engineers in charge of the SDR 1080i output. It later took delivery of a Sony HDRC-4000 unit, which was much better at converting to HLG and to SDR, but had already moved to HLG at that stage. Working in HLG wasn’t simple for the ENG cameras, and he eventually had to write his own look-up tables to convert from S-Log3 to HLG. These LUTs are also used by Adobe Media Encoder to deliver social media and other clips direct from the edit. Wrapping up, Warden insisted that by seeing UHD and HDR as the only way to go, live production is making life more difficult and expensive than it needs to. “Let’s decouple the resolution thing from the high dynamic range thing, and we’ll get there quicker. We’ll all benefit from it,” he said. By working this way, the ATP production crew found that “the SDR downconversion in the 1080i space looked really, really good,” almost becoming an ‘SDR-plus’ format.